Lots of pictures. Even after deleting half of them. This day was full of my favorite things: old inscriptions, beautiful landscapes, trees and a beach. And even a bit of yarn. The day started where it ended yesterday, at the friendly camping site near Castle Howard. We packed up the tent and our stuff and headd back to the road we took the day before. I wasn't in the mood to take pictures when we were there, but it was rather special. Too bad that it was hard to capture with my camera. The one above is the best I've got. It was a long, straight road, with some gates in the middle. At one end there was an obelisk. We couldn't decypher the inscription, which was a shame, because it was something like: "as long as these characters are visible, we will remember ... (his name was not readable, so sad). In a straight line from here, at the other end of that long road there was this monument. The inscription was clear, but it didn't say for who it was. Ater that we drove further. At Duncombe Park we ate a little brunch (and I took pictures of flowers). 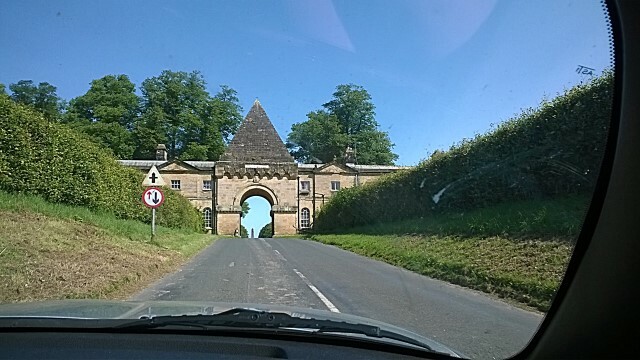 We took off again and drove through typical English villages. And past cute little churches. Rievaulx Abbey wasn't too well conserved, but still very impressive. I can imagine lots of ghost stories set here. 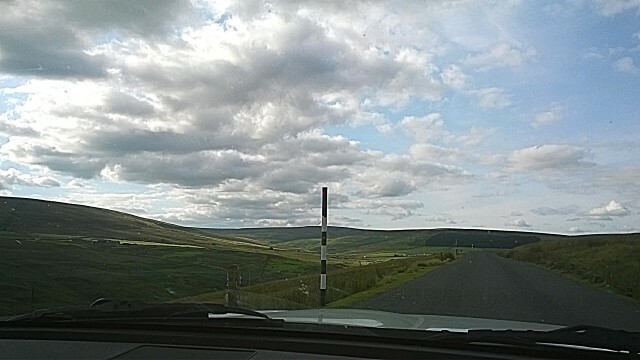 After that, we entered the North York Moors and spent many happy hours meandering through this beautiful national park. And then we found ourselves at the beach in Saltburn-by-the-Sea. There was a beautiful old pier. You could take an antique train up to the rest of the town. Or walk up. But we didn't (because we both have a fear of hights and a knee that didn't function too well). The pier was yarnbombed with a soccer theme. And then we went back to the moor once more. After a night in the hotel (we did appreciate the real bed and a good pillow), we started searching for a camping again and - thanks to the 30 minutes free wifi in the hotel - found one rather easy. We set up and had a few more hours to kill until it was time to meet our daughter. So we drove up to Hadrian's wall. We've always wanted to see that. After visiting so many remains of the Roman Empire in the past (we've been to Rome and Pompeji and many other sites) one might expect us to know better, but we were looking to find an actual wall. But that was not possible, there just isn't much left of it. Most of it is disappeared or under the ground which is not so strange after two millenia. We finally stopped at Chester's Fort, where we found not only the remains of that fort, but also a (very) small part of the wall. See, at the other side of the river. That's part of Hadrian's wall. We drove back to Durham, where we had a lot of catching up to do with our girl. She took us to the botanic garden, where we enjoyed the flowers, but forgot to take pictures, since we were still busy catching up (I hadn't seen her in two months and Skype is awsome, but nothing compared to real life meetings). Untill we ran into these mysterious numbers. We tried to figure it out, but we didn't understand what it meant. (Of course I couldn't refrain from googling it once we were home. This link says they are musical sequences, referencing the bells of Durham's cathedral and the flowers of the foxglove that is growing beside it). Then we walked down tot the town center (she's in a college up the hill) and passed a church with an intriguing cemetery. My simple camera couldn't quite catch the filtered light, but this picture is close to what we saw. We ate at one of E.'s favorite restaurants, did some more cathing up and went back to our tent, happy to know we had two full days of daughter time ahead of us. what beautiful sunny days you had to explore the wonderful countryside! Oh yes, the weather was exceptional. People kept telling us it was not the usual weather in Britain. But we liked it. We've been to the UK before and ended up soaking wet, so this was nice. We did expect to have to check into B&B's a few times when it was raining, but didn't need to.